ETL Data from mostly any database or file to target database. Overview of the Wilcon Stellwerk, the perfect and comprehensive tool for all your ETL needs. Extract Data from any database or file, transform the content and load it into a target database. Learn from live case studies from various industries and learn how Wilcon Data Stellwerk can work for you. Find out what are the key benefits for choosing the Wilcon Data Stellwerk as your ETL and Data Automation tool. Free No obligation 30 day free trial of the Wilcon Data Stellwerk. Try and test before you buy. 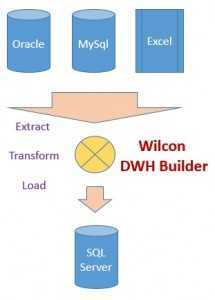 If you are convinced that the Wilcon Data Stellwerk is the tool of choice for you ETL needs, then buy it. Video on extracting data from an Oracle Db, transforming and loading on a SQL Server. Example of extracting from an Excel File, transforming and loading on a SQL Server. Video of extracting from a SQL Server, joining with reference data and loading to target database. Extract from SQL Server, transform with computational math operations and load into target database.